Down & Dirty: That is a good friend. Thursday a large box arrived from Cayce in California. The contents? A belated birthday present well worth waiting for: Meyer lemons! I first met the Meyer lemon last March on a visit to the Bay Area. This winter, as our supplies of blueberry lemon jam and lemon marmalade dwindled and I opened the last jar of preserved lemons, I began to panic. How could I replenish my supply? 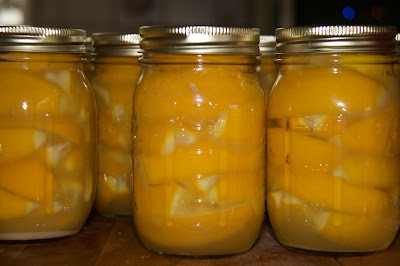 Yesterday, I put up 11 pints of preserved lemons. Most recipes that call for preserved lemons say to use only the rind, but I can never bring myself to throw away the salty, squishy pulp. It tastes too good to waste and makes the lemons last longer. We like them in salads, pasta, and tagines. Now that I have 11 jars (or WILL have, they need to sit and fester for 3-4 weeks), I'm looking for new ways to use this delicacy. We'll savor every bite, making them last till this time next year, when I might (if I'm very very lucky) get another well-considered birthday present from sunny CA. That's a lovely gift indeed! What are you doing to your kitchen? Which kitchen? MMMMMMMMMMMMMMMmmmmmmmmmmmmmmmmmmmmm. Preserved lemons. And I still have a key. This is where I stroke the upward curves of my sinister moustache. Good thing you got them just in time.